A rare joint press conference illustrated the severity of the Trump administration's latest attack on LGBTQ rights. After a report from The New York Times revealed federal agencies are circulating a memo that states transgender people and their identities aren't real in an attempt to justify the elimination of their civil rights, top LGBTQ advocacy groups are standing together in opposition. Representatives from the Human Rights Campaign, the American Civil Liberties Union, the National Center for Transgender Equality, the National LGBTQ Task Force, Lambda Legal, Center for American Progress, and PFLAG National all spoke up against the policy in a Monday morning press conference in Washington. The various organizations all promoted the same message: #WeWillNotBeErased. "We are all standing here, together, united to send one message," JoDee Winterhof, HRC's senior vice president for policy and political affairs, declared at the podium. 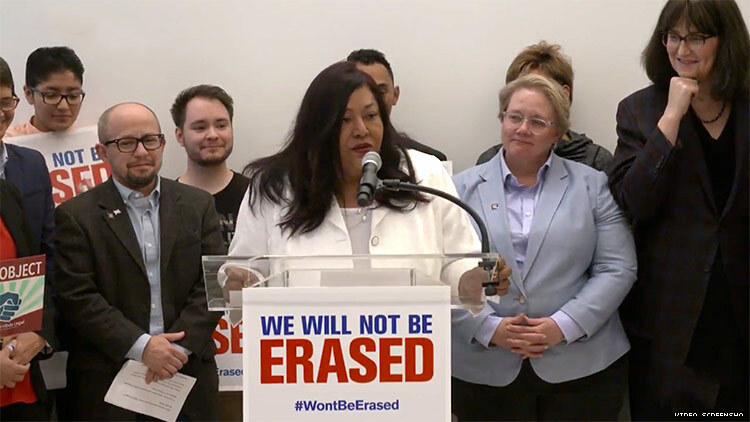 "No matter how hard the White House tries to get rid of us, we will not be erased."